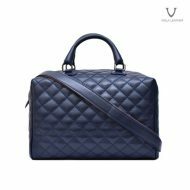 Voila Gianna is a lightweight, strong, simple, elegant leather bag perfect for your companion to the office, hanging out at the mall with friends and relatives, and for you everyday everyday daily activities. 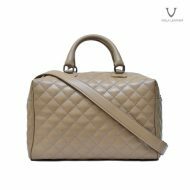 If you are on of genuine leather bag lover women and are looking for a lightweight, classy, elegant, simple, medium sized designed tote bag, Voila Gianna Leather Tote Bag is the perfect choice. 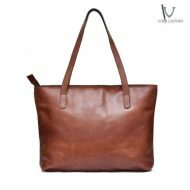 Voila Leather once again launch a new genuine leather tote bag – a lightweight medium sized handmade genuine leather bag with a classic, elegant, simple design for you, leather bag lovers. Voila Gianna Leather Tote Bag is a lightweight, medium sized, simple designed leather tote bag handmade using supple, flexible, soft, tender, flexible, not hard, not stiff charactered premium nappa cow leather material in classic light brown coloring – an elegant, classic camel color perfectly suitable with your colorful fashion outfits. Voila Gianna frontside is a handle strap ring, 3 round rivet studs decorating its nicely line stitched handle strap, while its backside is decorated with two straps. Voila Gianna interior is wrapped with light and strong polyester fabric lining, completed with two small pouches for keeping your valuable trinkets.